Plantique Landscaping - We create beautiful landscapes. It's in our nature. 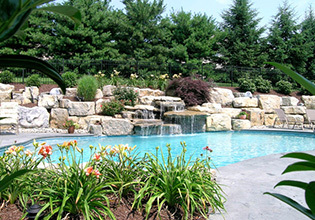 Superior Landscape Design & Build	It's in our nature! Residential Landscape Maintenance	All year long...so you don't have to worry about it. At Plantique, we offer a full range of high-quality services to upgrade your home’s or commercial property’s landscape. Whether your project is large or small, we can help. Have the outdoor living space you’ve always dreamed of. Plantique offers landscape maintenance for both residential and commercial customers and applications, including emergency work and scheduled maintenance programs. "We were a little hesitant to call Plantique because we thought they only did the big jobs. Boy were we wrong! From the moment our designer showed up for our first consult he made us feel comfortable and that our job was the most important one he was designing. We had a budget so we did part of the project last year and just finished phase 2 this Spring. We can't believe how our yard has transformed. The crew did a great job answered questions and left our yard spotless each day. The plantings are beautiful and the patio we put in is our favorite spot to relax. They even fixed a drainage issue that we have had since we built our home. The follow up has been great and we are already saving for the next phase!!" Whether you are looking for design services or landscape maintenance, for your residence or commercial property, we can offer quality and service you can trust.